This week’s installment of the Global Research New Hour marks the third of a five part series highlighting research into the World Trade Center attacks and the need for a renewed investigation. From September 8 to September 11, 2011, a gathering of researchers, experts and activists converged on the campus of Ryerson University in Toronto to review what was then the most up to date information with regard to the ten year old tragedy. Perhaps similar analyses could be directed toward historical figures like Darwin, Einstein and Galileo who similarly proposed views that contradicted what was believed in their time. Whatever the psychological foibles or quirks of the researcher in question, this week’s speakers provide seemingly strong and sound arguments contradicting the official depiction of events. Importantly, they make no claims like “Bush did it!” or “9/11 was an inside job!” They merely utilize evidence and the scientific method to reveal that controled demolition better explains the collapses of the three World Trade Center towers than does fire and gravity. Whether or not this assertion is conclusive, it certainly makes a strong argument for the re-opening of a new investigation. Richard Gage of the American Institute of Architects is a San Francisco-based architect and the founder of Architects and Engineers for 9/11 Truth. He has over 23 years of experience working with most types of building construction, including fire-proofed steel frame structures like the World Trade Center towers. Given his technical expertise, his numerous media apearances, his video Blueprint for Truth which has attracted a world-wide audience, and his compelling multi-media presentation, Gage has become among the 9/11 Truth movement’s most sought after figures. His Toronto presentation focused on evidence of the use of explosives in the collapse of the three World Trade Center towers. David Chandler is a physics teacher with a Master of Science Degree in mathematics from the California Polytechnique State University Pomona. He has published lucid on-line articles on the physical principles observervable in the collapse of the World Trade Center Towers. In particular, his article WTC7: NIST Admits Free Fall focuses on the significant errors and discrepancies in the National Institute for Standards and Technology official explanation of this third collapse. It is these very errors and discrepancies that form the basis for Chandler’s talk on Day 3 (September 10) of the Hearings. Graeme MacQueen received his PhD in Comparative Religion from Harvard University, and served as an instructor in McMaster University’s Department of Religious Studies. He is also a noted figure in the peace movement having helped found the McMaster Centre for Peace Studies in 1989. 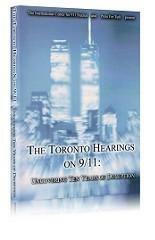 He is a recognized authority on aspects of the evidence relating to 9/11. His presentation centres on a compilation of eyewitness evidence of explosions in the collapses of the World Trade Center Twin Towers. Efforts are afoot to bring greater awareness of the flaws in the official 9/11 story to a broader public audience this September through a grassroots advertising campaign. For more information, visit RETHINK911.org. Also be sure to check out Global Research’s complete on-line dossier on 9/11. David Ray Griffin, Richard Gage, David Chandler, Michel Chossudovsky, Kevin Ryan, Niels Harrit, Barbara Honegger, Peter Dale Scott, Graeme MacQueen, Jonathan Cole, Cynthia McKinney …and many more!